If it weren't for the fact that Box Canyon is mentioned in the guidebooks for hikers, it would undoubtedly be less noticed than it already is. Anza-Borrego Desert State Park has no signs to mark its entrance. People can and do walk right by it. At Third Crossing (that's the Third Crossing of Coyote Creek as you come up the jeep trail from the end of the blacktop on DiGiorgio Road), a trail marked Lower Willows beckons you up a gradual incline about a quarter of a mile until you come to a trail marker directing you slightly to your left and down hill toward the embrace of the creek and its willows. At the trail marker, Box Canyon is to your right or north before you would go down the hill. 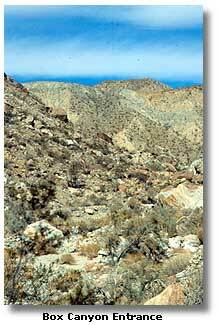 Lester Reed (author of Old Time Cattlemen and Other Pioneers of the Anza-Borrego Area) says the old cattlemen called it North Canyon, apparently because it runs due north. You could set your compass by it. From the outside looking in, it is not pretty. Your first view of Box Canyon is of a short broad avenue of a wash jammed with rocks and boulders of various sizes, cactus and other shrubs, and a jumble of trails. A steep but comparatively low ridge is in the background. But how do you get back there? How do you make your way up or across the arroyos? How do you stay on course when it is impossible to walk more than a few feet in any direction without encountering a plant or boulder or wall of earth? Welcome to bushwhacking, and be sure to orient your map, preferably the Collins Valley topographic map of the 7.5 minute series. As David Prescott Barrows put it, "The question that instantly arises in the mind of the visitor to the habitat of the [Cahuilla Indians] is, how can any people find here the satisfaction of their wants." He may well have been looking at the entrance to Box Canyon when he wrote this. 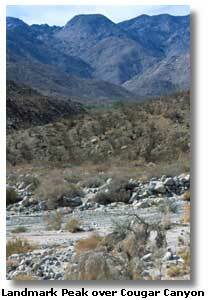 You get to a place like Box Canyon and you can't help but admire people like the Cahuilla who could survive out here. 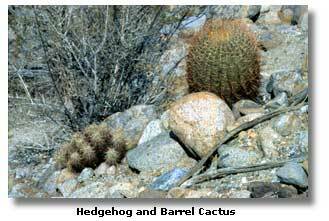 The high ground above Box Canyon may well have been a place where they hunted sheep. Certainly, the route out of Box Canyon connected the Coyote Creek Cahuilla with the Jackass Flat Cahuilla, and Cahuilla elsewhere in the Santa Rosa Mountains. The walk through Box Canyon and over the ridge to Hidden Spring is not to be undertaken lightly. 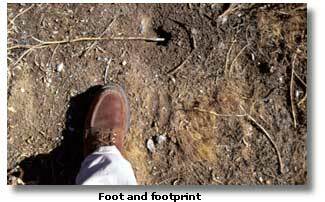 I found the trail description in Schad's Afoot and Afield in San Diego County to be helpful. Before leaving home, I spread my Collins Valley topographic map on the kitchen table and marked a knoll at two thousand seven hundred and twenty feet and a saddle at two thousand six hundred and fifty feet, in accordance with Schad's description. These marks helped me find my way. I should say they would have helped me had I walked all the way to Rockhouse Canyon. Unfortunately, my hiking partner became ill as we crossed the ridge. In the middle of the afternoon, he set up his tent and got off his feet while I put down my pack and explored the area on foot. I saw a lone sheep. Later, I came across a bone, apparently the leg bone of another sheep, with blood and a little fresh flesh still attached. I wondered if the mate of the lone sheep had died that day. The sunset that evening was beautiful. This is walkers' country, and country for people who don't want a lot of company. The rocks, brush and gullies see to that. Most of the time, there are no trails. 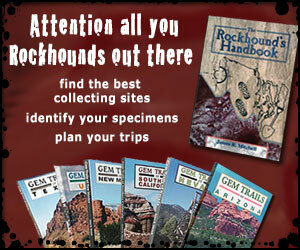 You just make your way as best you can, following your map and suggestions from the guidebooks. 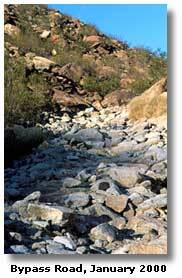 The trail from Box Canyon across the mountains leads to Hidden Spring on a corner of Jackass Flat. About four miles away is the mine from which Nicolas Shwarz, it is said, once took about eighteen thousand dollars in gold. From Hidden Spring, you can continue into the Santa Rosa Mountains, or you can turn south into Butler and finally Rockhouse Canyon and go south through Clark Valley, crossing back to the Borrego Valley by way of Alcoholic Pass. Collins Valley has always seemed to me to be a perfect desert destination as well as a jumping-off place. It's remote, but not too much so, just an easy six mile stroll from the end of the pavement on DiGiorgio Road. It's out of reach for conventional motor vehicles, but getting there on foot isn't hard. When you climb the jeep trail from Third Crossing and get your first view of it, Collins Valley seems a cozy place. It's not hard to imagine its appeal to people through the centuries. From south to north, it's less than six miles up the valley from Lower Willows to Middle Willows on an uphill incline so slight and so gradual as to be barely noticeable. From west to east, or left to right, Collins Valley is about two miles across. Coyote Creek runs the year-round down the valley's east side. Over on the west side are the canyons with seasonal streams, palm trees and trails into the hills. Indian Canyon, which leads to the Los Coyotes Indian Reservation (off limits to hikers without previous permission) has the remains of a tin mine. 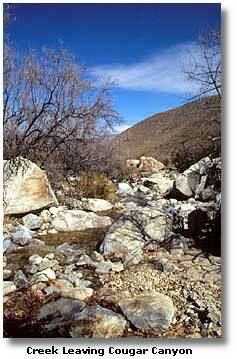 Cougar Canyon has a year-round stream, waterfalls and an old Indian temescal. Sheep Canyon provides a palm bowl and the Salvador Canyon and Fig Tree Valley routes. Salvador Canyon, named for Salvador Ygnacio Linares who was born nearby on the 1775 Anza expedition, was known to old-timers as Thousand Palms Canyon. 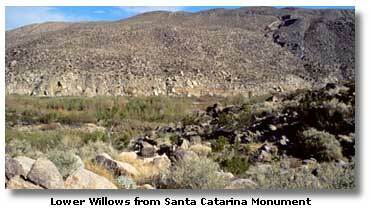 The Anza party camped here at Santa Catarina Spring beside Lower Willows. In the 1880s, an American cattleman named Joel Reed claimed squatters rights and built a home at Santa Catarina Spring. He spent a good portion of the rest of his life protecting his claim. Indeed, a man named John Collins took possession of the area for a while in 1910 while Reed was away. Unfortunately for Reed, this was also the year they drew up the maps. Hence the name Collins Valley. The first time I ever walked into Collins Valley, it was on a weekday and there was no one around. If you want to be out there with minimum company, visit on a weekday. As a matter of fact, I was tired after trudging up the wash from Lower Willows to the Sheep Canyon primitive campground. When I reached an embankment with a view of the area, I decided to sit down in the shade of a low shrub. Lost in thought, I nearly jumped out of my skin when a bird made a crash landing on a metal road sign beside me. It is doubtful I will ever forget my walk early the next morning when across the way, I saw an owl returning to her nest in the hills. She was going home after a long night of work. After my long night in my tent, I was about to begin the happy work of walking around the valley. I tend to avoid the Cougar Canyon, Sheep Canyon, Indian Canyon and Salvador Canyon because they attract so many people. I usually prefer solitude. One day I was out there, however, when I found myself in the company of a troop of wide-eyed boy scouts. They started questioning me about directions, and their hunger for knowledge and information charmed me. Perhaps, I thought later, I should volunteer as some kind of scout leader. 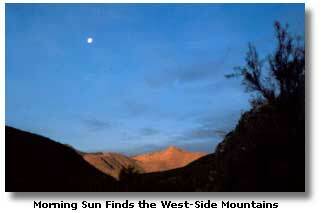 One warm afternoon, I waited until late in the day before walking up Borrego Valley. As I reached Third Crossing, I calculated that I had enough time to get over the ridge and into Collins Valley more or less by dark. There was little or no traffic on the road that evening. I figured I pretty much had the place to myself and when I got to the top of the ridge looking down into the valley and it was dark, I decided to just pull off the trail a few feet and set up my tent. At about 1 o'clock in the morning I was awakened by couple of voices. Opening my eyes, I could see the lights of two flashlights dancing up the trail. I never knew who the people were, but I passed them the next morning. They had decided to camp a few hundred yards beyond the place where I was, and they were sound asleep, missing the best part of the day. I saw them later in the day. The man, who looked to be smaller than the woman, was carrying their one backpack. So much for equal sharing of the load, I thought. I always enjoy camping in the valley around Santa Catarina Spring. The ground holds a tent stake well, and the place attracts fewer campers than the canyons do. 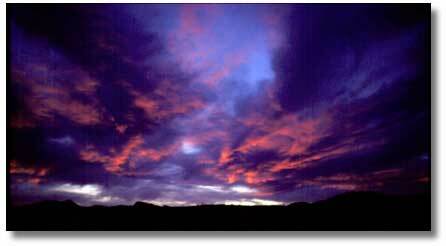 I went to bed out there one evening when it was dark. A few hours later, the moon rose over the low hills to the east and flooded the whole area in moonlight. Later I heard what I thought might have been an owl taking a small animal. I have also walked through Collins Valley on my way to Middle Willows and points north, but that, depending on where you begin, is a two-night backpack. I have walked the jeep trail and I have walked partly in the riding and hiking trail (which can be slow going after horses have churned up the sand) and partly in the Coyote Creek watercourse. At times when Coyote Creek is not so full, it's possible to enter or leave Collins Valley by way of Lower Willows.